Tina Medina is a Dallas artist and professor of art at Mountain View College. She earned her Bachelor Of Fine Arts degree at Texas Tech university and Master of Fine Arts degree at the University Of North Texas. Her art has been exhibited locally at various venues in Dallas and in Austin she was selected by the Mexico-Arte Museum to be showcased in the 7th Annual Young Latino Artist's Exhibition, as well as awarded a solo Show at Women and Their Work Gallery. Medina's work was also featured in national exhibitions at Galeria de la Raza in San Francisco, Arizona State University and the National Women's Studies Associaton Conference, Walker's Point Center for the Arts, Wisconsin. 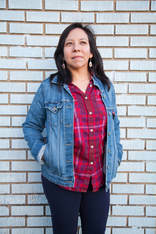 Medina curated exhibitions such as Ojo: The Unexpected: Contemporary Latin American Artists Of the Metroplex, ELLA: Exhibiting Local Latina Artists at the Dallas Latino Cultural Center and Her Obsidian Intentions: Contemporary Latina Artists. Recently Professor Medina presented at the 2016 Latino Art Now conference in Chicago, Illinois and her work was displayed at the Galeria América Of the Institute for Latino Studies, of Notre Dame, Indiana. "​As a US American woman with indigenous and European ancestry, my work addresses my identity and explores issues related to my experiences and thoughts on society and culture. I am compelled to investigate the precariousness of cultural identity. Our past and present history influences how we perceive others, as well as how we perceive ourselves. In my art I explore themes such as American history, ethnicity, gender and power using nontraditional materials and mixed media via painting, assemblage, site specific installation, audio, and performance."